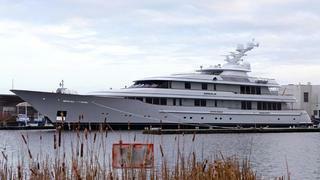 A significant launch took place this weekend when the 67.27 metre motor yacht Drizzle (hull 683) hit the water at the Koninklijke De Vries Scheepsbouw yard in Aalsmeer, the Netherlands. Drizzle inherits the name of the 55.5 metre Feadship, launched in 2005 as Twizzle, winner of a World Superyacht Award, and now called Issana following a recent sale. The owners decided to build their own yacht Drizzle, using their former yacht's classic design and perfect proportions as a starting point. Drizzle is powered by twin 1,520kW MTU engines and will start her sea trials soon, with delivery scheduled for the Spring.